The Royal Observatory in Greenwich has announced its shortlist for the Insight Astronomy Photographer of the Year competition. From nebulas and auroras through to starbursts and solar eclipses, these photographs will rekindle your sense of wonder. This year’s competition was the biggest yet. Judges from the ROG had to pore through 4,500 entries submitted by amateurs and professionals from over 80 countries. The winners of the competition’s nine categories will be announced on September 15, 2016, and the winning images will be put on display in a free exhibition at the Observatory’s Astronomy Center. A Royal Spoonbill basks in the glow of the nearly Full Moon in Hawke’s Bay, New Zealand. Taken from Sefton Bivouac, the oldest hut in Mount Cook National Park, New Zealand, star trails spiral over the majestic mountains of the park and the seemingly peaceful village below. With temperatures well below zero, it’s not surprising that photographer Lee Cook was the only person in the vicinity of Plateau Hut in Mount Cook National Park, New Zealand. A view of the Halley 6 Research Station situated on the Brunt Ice Shelf, Antarctica. The vivid green Northern Lights resemble a bird soaring over open water in Olderdalen, Norway. New Year’s Day 2016 at Nugget Point on the South Otago coast of New Zealand. The Milky Way stretches across the night sky between two of the imposing rocks at Pfeiffer State Beach, near Big Sur, California. The natural light of the Milky Way battles with the light pollution over this fishing village in Batu Pahat, Malaysia. In the lower right hand corner you can see some bioluminescence. A mesmerising lunar halo forms around the moon in the night sky above Norway. The rare opportunity of seeing five planets—Mercury, Venus, Mars, Saturn and Jupiter—gleaming in the night sky over the Alps. 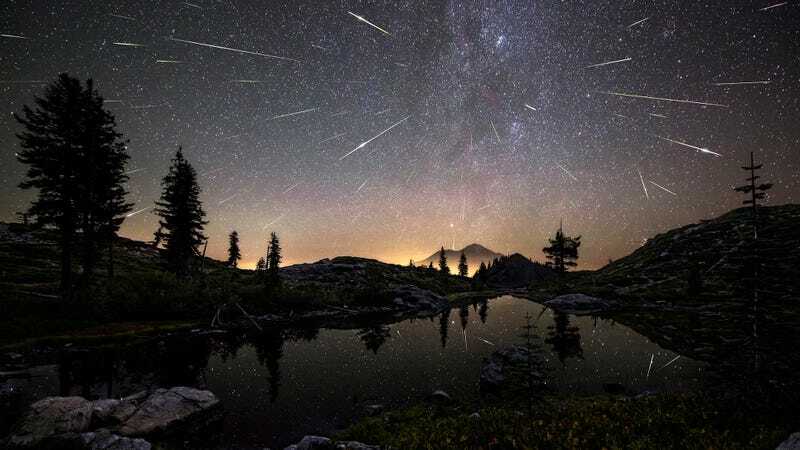 The Perseid Meteor Shower shoots across the sky in the early hours of August 13, 2015, appearing to cascade from Mount Shasta in California. The composite image features roughly 65 meteors captured by photographer Brad Goldpaint between 12:30am and 4:30am. The celestial curve of the Milky Way joins with the light of a headlamp to form an arch over the Cimon della Pella in the heart of the Dolomites mountain range in Italy. A filaprom strand extends from the surface of the sun. Filaproms are large, gaseous features that can be partially seem over the Sun’s disk as a filament, and they are known to reach lengths equal to 150 Earths aligned. Taken from atop the Semnoz Mountain, the International Space Station arcs over the city of Annecy, France, as Venus and the Moon loom overhead. The ISS pierces a path across the sky in Harrogate, South Australia. Jupiter in all it’s gaseous glory. New stars are formed in the undulating clouds of M8, a.k.a. the Lagoon Nebula, located some 5,000 light years from Earth. About 12 million light years away from our planet, lays the starburst galaxy M82, also known as the Cigar Galaxy. In a show of radiant red, the superwind bursts out from the galaxy, believed to be the closest place to our planet in which the conditions are similar to that of the early Universe, where a plethora of stars are forming. The moon illuminates the night sky, and is reflected in the expansive water of the Paraty Bay, Brazil. With very little light pollution, the glimmering stars of the Milky Way bathe the colourful layers of the Painted Hills of Oregon in a natural glow. The shadow of Manua Kea, the highest peak in the state of Hawaii, is projected by the rising sun over the volcano, Hualalai, as the Full Moon soars above. Total Solar Eclipse of March 9, 2016, as seen in in Indonesia. Comet Lovejoy as it appeared on January 21, 2015. Comet Lovejoy passes near the open star cluster of the Pleiades or Seven Sisters. The seldom-seen alignment of the five planets in February 2016, Venus, Mercury and the Milky Way. This photo was taken at Turrimeta Beach, Australia.